Ground Control Touring is ecstatic to announce Sacred Paws as the newest addition to our artist roster. Sacred Paws formed in 2014 when guitarist and vocalist Rachel Aggs (also a member of Shopping and Trash Kit) and drummer Eilidh Rodgers’ former band Golden Grrrls disbanded. 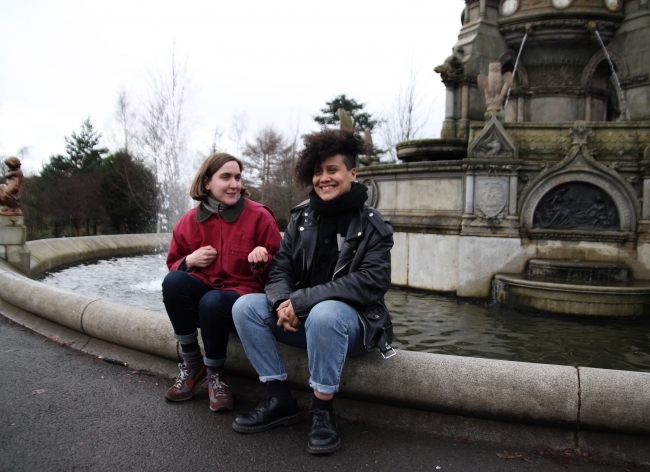 Looking for a good excuse to continue hanging out despite living hundreds of miles apart – with Rachel residing in London and Eilidh based in Glasgow – the two have traveled every few months to write songs. The excitement of the two friends meeting after months away from one another bleeds into each Sacred Paws songs, and even the tracks with heavier or more contemplative lyrical content are full of sunny and infectious melodies. Sacred Paws’ debut album Strike A Match is a collection of ten complex yet instantly infectious songs, described by Pitchfork as “… tightly-wound art punk [that] unspools their anxiety and turns it into something worth celebrating”. The record was awarded the 2017 Scottish Album of the Year Award, beating the likes of Mogwai, Honeyblood, Pictish Trail and C Duncan to the title. Keep your eyes peeled on Sacred Paws’ artist page for upcoming tour dates and news.